In many 4X games, each planet you colonise is its own little dot on a map and functions completely independently. For Predestination, we want players to be able to set up more complex and efficient empires by giving you the option to transport resources between planets; that’s where Trade Routes come in. You can set up a trade route between any two planets you own and select to send metal, food, energy, or even population each turn from one planet to the other. The trade route will keep churning away every turn as long as the planet of origin doesn’t run out of the resources you’re sending. Trade Routes between two planets in the same star system are free, but you can set up routes between two planets in different star systems at a cost of 1BC/turn. Inter-system Trade Routes are shown as lines between the two stars on the galaxy map, and they can be blockaded by enemy ships in either the starting or destination system. To break through the blockade, you can either station your own ships there to protect your shipments or sign a Non-Aggression Pact with the enemy. 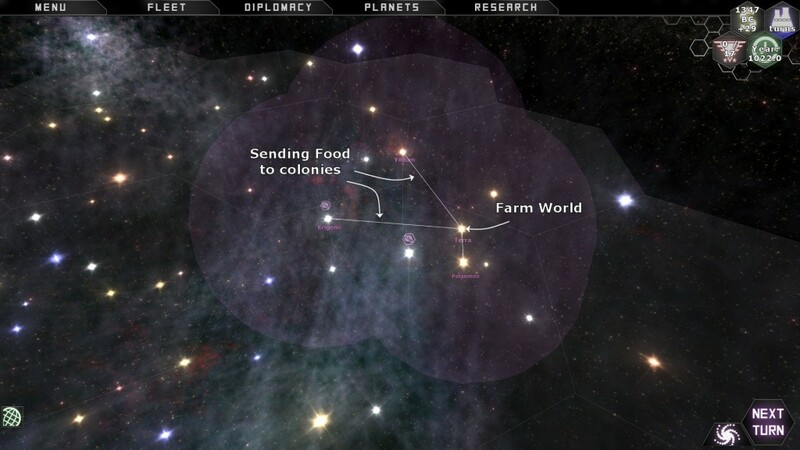 Create a farming world that produces tons of food, then set up trade routes to supply that food to your other planets. Build up a bunch of mining planets and send all the metal to a central shipyard world. Send population from fully colonised planets to new ones so you don’t have to wait for population to slowly grow. Set up a Molten planet as a geothermal energy farm, and send that energy out to your other planets. Make an emergency storage reserve planet and send all your excess food/metal/energy there to use later. We could change the population growth rate equation and the number required to run each piece of infrastructure in order to make planets reach full productive capacity more slowly. This would encourage people to send excess population to new planets to give them a kick-start, a bit like freightering population in MOO2. We could add a Pirate race option that gets you money from blockading enemy trade routes. We could tweak the production speed cap on shipyards so that you’ll need to send metal from at least one other star system to realistically reach it toward the end of the game. We’ll likely reduce the food output of Hydroponic Farms and Food Replicators to encourage players to farm Terran worlds and send the food out to other planets. Barren, Toxic, or Molten planets should be totally dependent on food imports or replicators. We may even remove Hydroponic Farms entirely. We may reduce the number of ore and uranium deposits on habitable worlds and increase the number on barren planets to encourage specialisation. One of the problems that’s regularly reported to us is that the fleet icons sometimes overlap stars on the galaxy map and make it difficult to select a star. We’ve tried a number of solutions to this problem, and have now settled on a plan to tackle it. We’re adding a number of tabs to the star system window to allow us to convey additional information at a glance, including tabs for Your Ships and Enemy Ships. When you click on a fleet’s icon while it’s stationed at a star system, the system window will open at the the appropriate tab. That way if you meant to click on the star but accidentally click on a fleet, the star system still opens and you’re just in the wrong info tab. 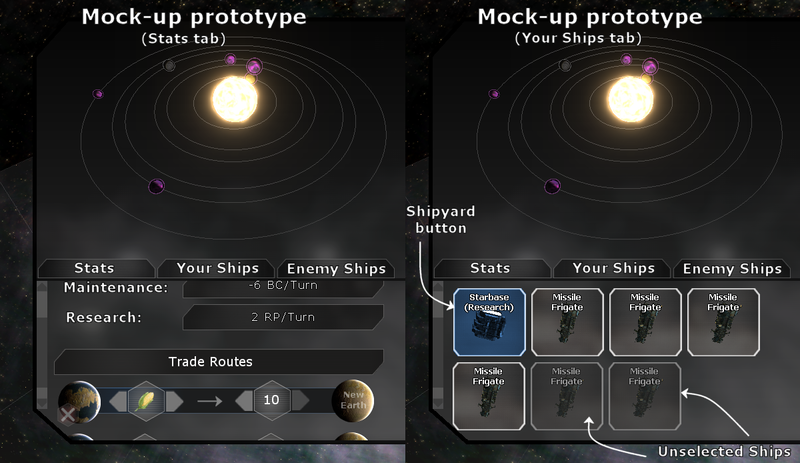 The Your Ships tab will function the same as the Fleet Window, so you’ll be able to select ships from this list and then send them to another star system. The game will then create a new fleet with those ships and move it one turn toward its new destination so that the fleet icon for a fleet in transit never overlaps with the star system. If you have a shipyard in the system, it will be included as the first ship in the Friendly Ships tab and clicking on it will open the Shipyard Screen. A new Stats tab will allow us to keep an eye on our empires at the star system level, showing previously difficult-to-find stats for the entire star system and giving us somewhere to put extra system information. It’ll show stats like Shipyard Build Rate, nebula effects (for stars inside a nebula), any effects from random events or rare specials in the system, and total aggregated stats like tax, upkeep costs, research, metal production, population etc. We’ll also add a list of trade routes originating or ending in that star system to give you a quick way to see if there’s something wrong and which planet has the problem. We can also let you change the trade route directly from this menu to fix problems without going into the planet screen. We’re anxious to see how Trade Routes change the game for people, so we’ll be deploying the Trade Routes and System UI overhaul first as one patch and then the Diplomacy will be a separate patch afterward. We’ve put together a Diplomacy ideas thread on the Steam forums to ask what you’d like to see in the diplomacy gameplay and get feedback on a few ideas we’re considering. We don’t have a firm release date for the Trade Route patch, but I expect it to be about one week away based on the amount of work to be done. Thanks for reading this month’s dev update on Predestination, and I hope everyone’s enjoying the alpha! Tagged 3d, 4x, devblog, development, galaxy, game, game design, game development, game-design, indie game development, master-of-orion, micromanagement, moo2, planet, planets, predestination, screenshot, space, trade route, trade-routes, ui, user interface, video.